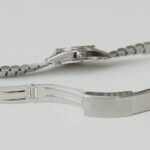 Sometime s a watch band clasp will wear out before a watch band does. 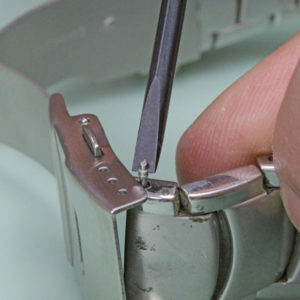 If you don’t want to replace your whole watch band you can always just replace the clasp itself. 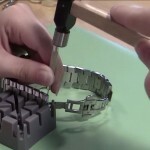 Use this guide to learn how to change tri-fold style watch band clasps with a security catch and push buttons. 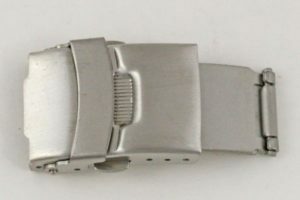 How do you know if a watch clasp is a tri-fold clasp? When the clasp is open there will be three metal plates and two joints. 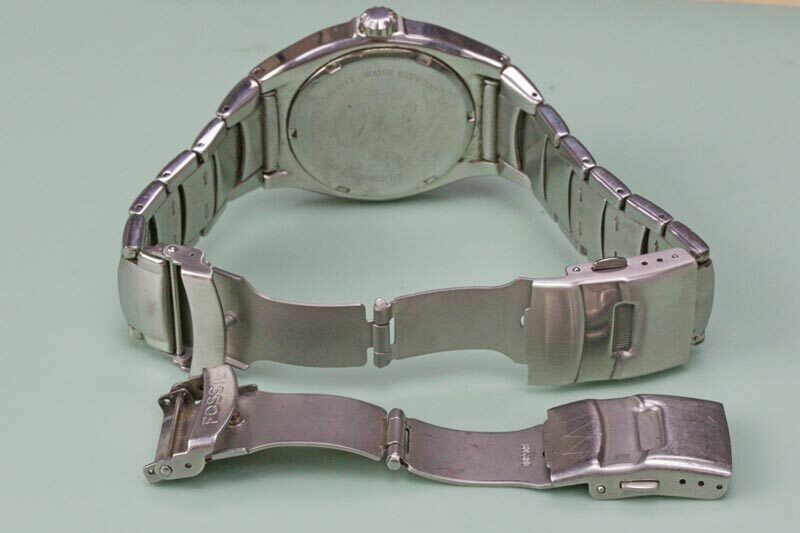 When it is closed the two lower plates will fold under the clasp that matches the watch band style. 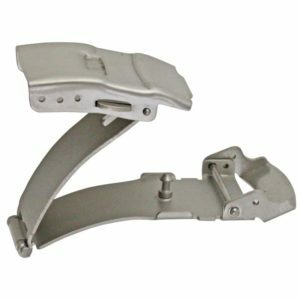 The security latch will have a metal tongue that locks over the top of the clasp when it is closed and there will be a button on both sides of the clasp that also lock the clasp closed. The first step is to remove the old clasp. Using the pointed end of a spring bar tool, push down on the spring bar to compress it. 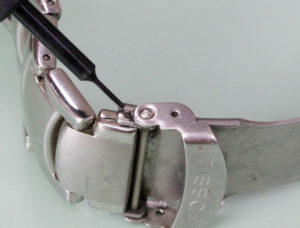 Then angle your spring bar tool to slide the watch band and compressed spring bar out of the clasp. 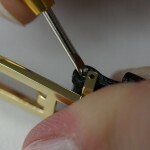 Repeat the first step for the other side of the clasp to completely remove the clasp from the watch band. Next, use the old clasp to measure the dimensions needed for the new one. With your digital gauge, measure the outside width of the clasp at the end by the security latch, like this. 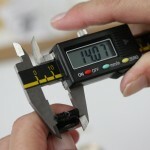 Using a digital gauge , measure the inside of the removed clasp. 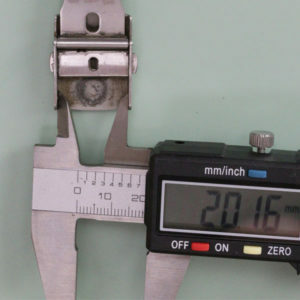 Measuring the outside width of the watch band where the clasp attaches will work too. 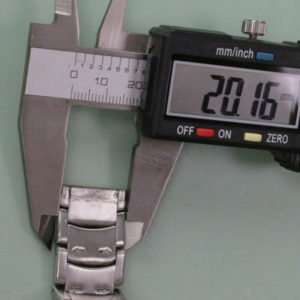 Once you have these numbers in hand, order the corresponding size and color replacement watch band clasp from Esslinger.com. With the ne w clasp in hand and open, start by inserting the spring bar into the band that is on the 6 O’clock position of your watch dial. 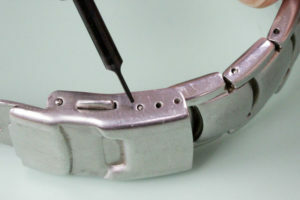 Holding the band with inserted spring bar, insert the band into the non-cover end of the clasp. 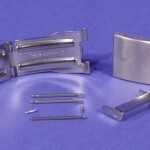 With the spring bar aligned in one side of the clasp, use the forked end of the spring bar tool to compress the spring bar and slide the band into place in the clasp. Wiggle the watch band around until the spring bar clicks into place. Repeat this step on the cover side of the clasp to attach it completely. When both sides of the new clasp are attached to the watchband, you can wear your watch again with pride. 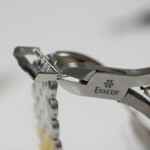 To find watch repair products, or to learn more about watch repair, you can check out Esslinger-dot-com’s Learning Center.